Getting active for a healthier Danube in Ilok, Osijek and Vukovar! The historic hillside town of Ilok was the location for a community river bank clean-up along the Danube. Transforming 2 km of riverside, the action led by Hrvatske vode, local groups and Coca-Cola HBC not only improved the local environment, but reduced the amount of rubbish travelling downstream. Residents of Vukovar also rolled up their sleeves for a clean-up of the harbour area and celebrated with a fishing festival, exhibition and free boat trips. Approaches to protecting the Danube rivers' natural resources. Taking place near Osijek, it was organised by the Natural Resources Management Agency and Kopački rit Nature Park. To see how all the countries celebrated in 2018, go to Review 2018. You can also revisit 15 years of Croatia's Danube Day via the general Review page. Lidija Baras of Hrvatske vode (Croatian Waters) at Lidija.Baras@voda.hr. Read more about Danube Day on the website of Hrvatske vode. Sanja Genzić Jurišević of the Ministry of Environment and Energy at Sanja.GenzicJurisevic@mzoe.hr. 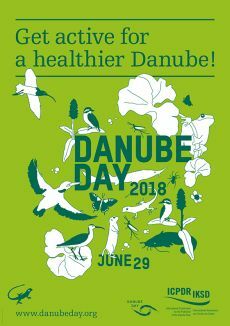 See also the ministry's website for information on Danube Day. For Croatia's Danube Art Master, view the Croatian factsheet or contact Adriana Blažević of Green Osijek on +385 31 565 181; mobile: +385 97 606 9881; zeleniosijek@zeleni-osijek.hr; adriana@zeleni-osijek.hr.